Kat Von D Dumped Jesse James for Nikki Sixx? Just last month Kat Von D was madly in love with her new boyfriend Jesse James…..and now a source tells People that Kat isn’t happy about Jesse’s recent move to Austin, Texas, and she’s losing patience with their “weekend fly-back-and-forth relationship.” And recently, the 28-year-old “L.A. Ink” star has been seen out and about with OTHER guys, including her ex boyfriend Nikki Sixx! 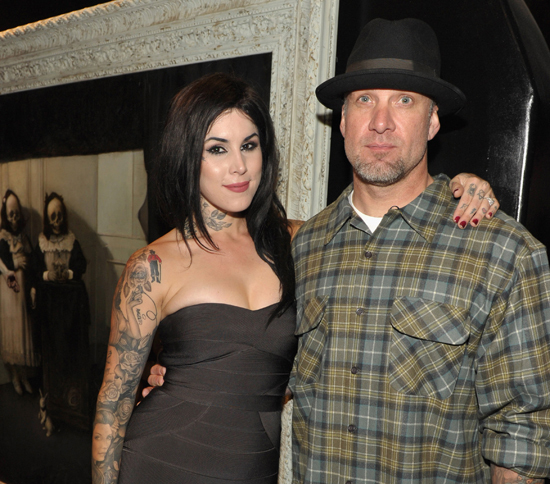 Kat Von D proclaimed her love for Jesse James only last month, but is trouble already brewing between the tattooed twosome? The couple were last seen together lunching at The Counter in West Hollywood on Oct. 3. At the time, “they looked very happy and kept kissing,” a source tells PEOPLE. But a source says that Von D isn’t happy about James’s having moved to Austin, Texas, and is losing patience with their “weekend fly-back-and-forth relationship.” And since the pair’s last outing, the L.A. Ink star, 28, has been spotted getting close to other guys. A source says Von D and Margera, who is married, “are not more than friends.” They both attended Wednesday night’s Jackass 3D premiere in L.A., where Von D once again spent time with her ex, Nikki Sixx. A rep for Von D has no comment. Uh-oh!! Sounds like Kat is shopping around. Jesse better do some serious making up before he loses his tattooed lover!